This exciting and unusual Blizzard's game was announced last year, and the developers reveal the information about it very seldom. But today we have got a great portion of the news: the Heroes of the Storm trailer, which shows the first character of the upcoming project. As you may have already heard, Heroes of the Storm is a multiplayer game, in which you play with a team of allies. Each hero from the squad is a well-known character in the universe of Blizzard's games. Here you will be able to meet the personages from Diablo, StarСraft and World of Warcraft, and today's Heroes of the Storm trailer shows us a hero of StarСraft II. So, meet Tychus - a brilliant warrior, who is in a bad reputation. But if we forget about his moral values, we are getting a great soldier and an important part of the team. He has several abilities and weapons, and can kill the numerous enemies easily and quickly. 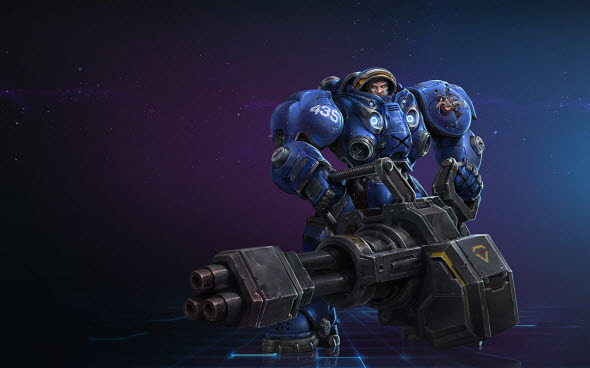 Tychus uses explosives, grenades and a powerful minigun. The first two types of weapon deal a great damage, which strikes the number of heroes in some area. The minigun requires some time to spin it up, but after it fires very fast and is extremely dangerous. Also, Tychus uses laser drill, which was developed for the mining operations, but it's good as a weapon too. And his most powerful gadget is a robot named Odin. How do you like the first announced character and new Heroes of the Storm trailer? Are you waiting for this game? Tell us about your impressions in the comments below.